← Do you Google?…It’s more than just a search engine. Have been a part of 40+ Google Apps deployments including few complex and bigger ones. Have provided training to lot of “Google Apps for business” clients and have more than 10 verifiable recommendations. Now I am going to apply for GA certified trainers but I have worked with Google Apps for business clients mostly, do you think, it would be a problem? Is there anything else you want me to suggest before applying? Thanks for the comment. I have forwarded your question on to get a better answer for you. I don’t think it would be a problem for you to apply. Especially, if you have worked or plan on working with educational training. I will let you know more when if I get more information back on your question. I have just found your blog….I am having trouble finding information on becoming a Certified trainer in Google Apps – Do you know if the cost of the test is still $15? And do you have any contacts at Google who can help with this endeavor? I believe the tests are still $15 dollars each (6 total). As far as the contact goes, the best thing I can recommend to do is to go through the training center, take the tests, fill out the applications and if this is truly something you are passionate about it will happen. You can also check out http://cue.org/cuetoyou/googleapps to see if there are any trainings in your area or if you would like to host an event. The certificate says it’s valid for 12 months… What happens after that? Have to take all the exams again? Great post and video Danny. The video provides good insight into what’s expected in the application process, and was something that I could immediately put to use. I’m still working my way through the initial qualification exams, but am looking to pursue certified trainer qualifications eventually. Thanks for sharing! What are some benefits once you obtain the Google Certificate Program AdWord? I had recently registered but not so sure when I can official take the Exam for the certification.Does it improve my marketing ideas? I’m sorry, I don’t know enough about the AdWords program to answer. I got my training and certification in Google Apps For EDU. Maybe someone else can help. 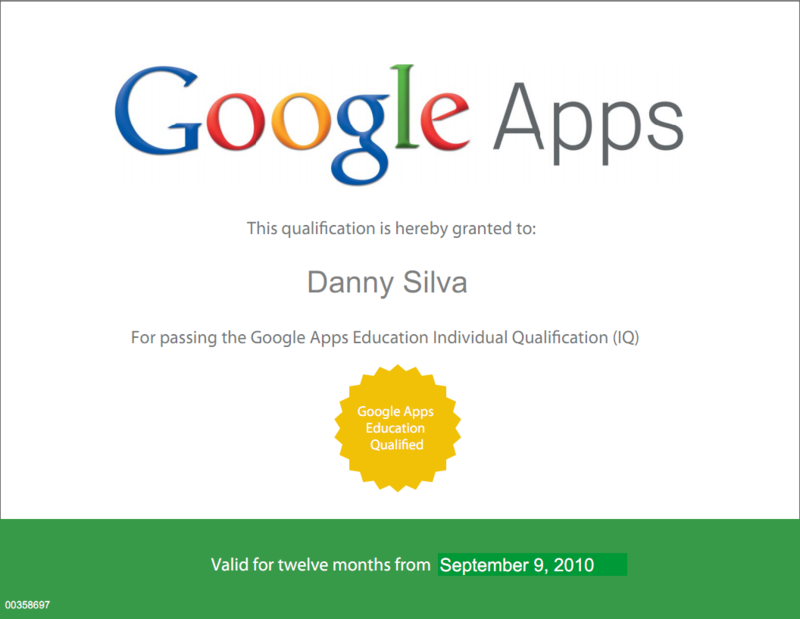 Hi Danny, I am currently unemployed and wish to get ‘qualified’ in Google Apps for EDU and Business – However, when I register it askes for an affiliation which I do not have at this time. I have emailed Google and received a form response about how to sign up. Do you know if there is a way to get ‘qualified’/’certified’ without being affiliated with a school or business? I would list my former job in education. I believe they want to make sure you have a background in education to become Apps Certified for Education. Do you know if there are any sample questions from the Google Apps for Education Certification test? I found a few for the Google Apps Deployment Specialist but so far none for the Education tests. Danny, great video. I spend about 50% of my time on tech-related activities, including trainings. I am not a teacher, rather a professional trainer with a Dale Carnegie certification. I already approved the qualification exams. DO you foresee that nbot being a teacher will be a problem to reach GAFE cert trainer status? What is the difference between a certified teacher and a certified trainer? You have both listed. If the majority of your work is training teachers then I don’t think it would be a problem. However, I don’t approve applications so I can’t say for sure.